I've come to realize that my mind works in strange ways. I'm usually thinking of things when it isn't the season to think about them. Know what I'm talking about? Most crafters do. So, in August I couldn't wait to start pulling out the fall/Halloween decor - in August! I held out until just a few days before September though. However, today, one day before October, I'm already gearing up for Christmas. Sick, right?! Here's my first Christmas project. 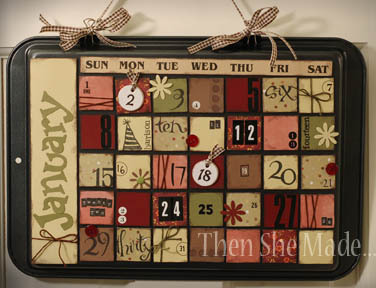 I've been making cookie sheet calendars for years. At one point in time I even made them to sell so I've probably made at least 30+. However, I've never kept a single one for myself and I LOVE them. So, while I'm making a few of them for Christmas gifts this year, I'll be making me one too - yeah!!! In case you've never seen one, here's what they look like. These are a few I've made for classes I've taught or gifts and you can make them out of left over scraps and mismatched stickers - cool right?! I'm all about using up my supplies. 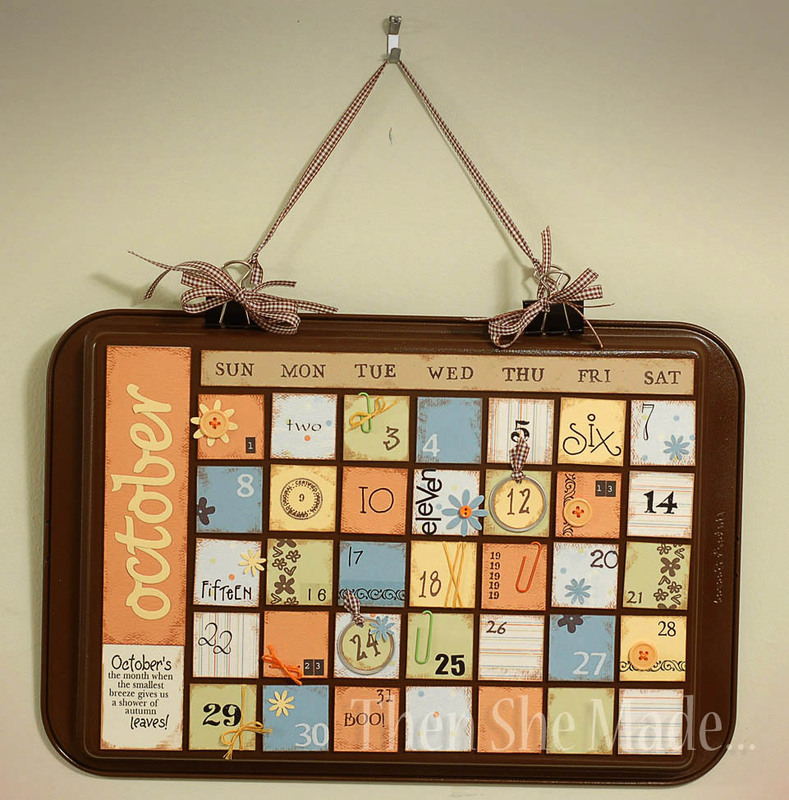 The idea is that it's a perpetual calendar that is magnetic so each month you just move the pieces into the right place. All the unused pieces store on the back. 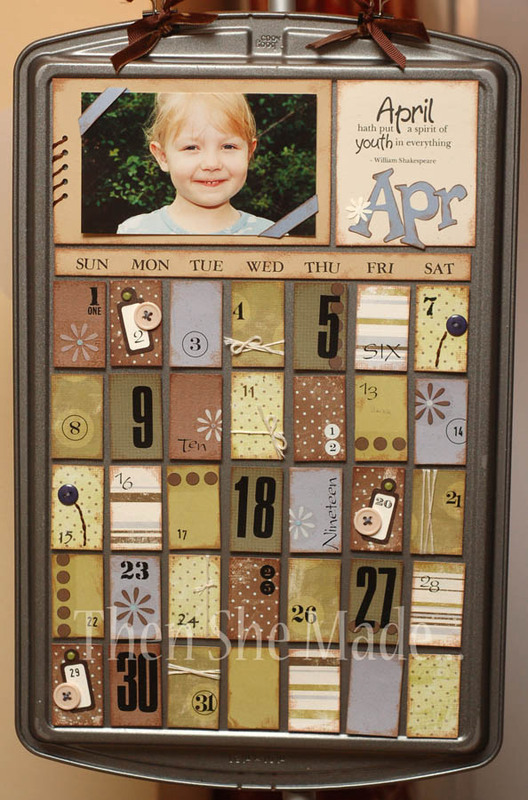 You can totally personalize it with peoples names for their birthdays or use pictures of them too. You can make them horizontal or vertical. 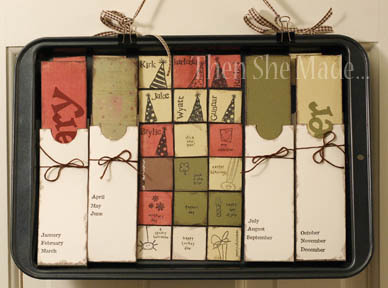 The green and red horizontal one I made for my sister-in-law and the vertical one I made for a class I taught a few years back. Fun, right? I can't wait to get started. I love this idea!!!! I would have never thought of it. Can't wait for the tutorial! I would love love love to make one! How much would it set me back? Tutorial is in the works. Hopefully I'll have it up early next week. In the meantime though, go buy a cookie sheet. Don't buy big ones, just the average size which I think is close to 10x15 - not sure. 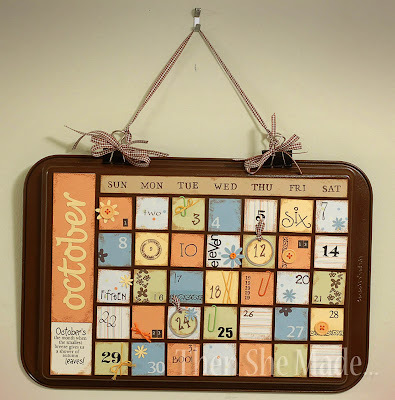 Also make sure that it has a rimmed edge so you can attach binder clips to hang it. I'll have more detailed info and pictures in tutorial but at least it's a start. Mary, as for cost. You can go super cheap or really expensive. If you already have a lot of scrapbooking supplies like stamps, stickers and paper all you'll need to buy will be magnets, cookie sheet and clips, so at most $15. Otherwise if you have to by the embellishments too, you'll be in it more. check the dollar store for stickers and rub-ons though, that's a good place to start collecting numbers. I have cookie sheet that is ready for retirement, but am loathe to just toss it out because it seems wasteful. But this is perfect! Maybe after a little spray painting, though. ;) *gasp* Maybe chalk board paint! Where on earth did you get your stamps for the days of the month (1, 2, 3 etc?) I am dying to make some of these as Christmas gifts, and want to get everything ready but am having a hard time finding stamps. Did you not use stamps and just use something else? Oh please oh please oh please hurry the tutorial! I cannot wait to have the family Christmas gifts done (they are all getting one of these). Thank you so much! WOW! So cute! My cookie sheets are aluminum...so the magnets don't stick. :( Suggestions? Just posted on my blog about the calendars I made using your inspiration! !